YoYoExpert - High End Polyester String! The Core is the center, it is the innermost essential part of everything. It is where we draw our strength to do all the amazing things we do. When we designed our latest string that is the strength and power we were after! This is YoYoExpert CORE String! When you use most boutique string you experience a sad disadvantage. In order to create a high-end string with a good bounce, softness, and increased longevity you inherently need to make it fatter and therefore, tighter. Fatter string needs to be adjusted far more often and tighter string can get easily kinked, especially during longer combos. 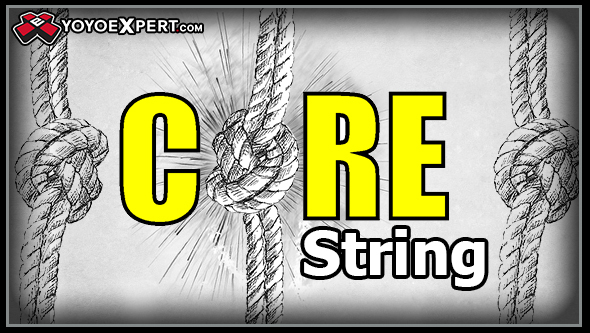 The idea behind CORE string was to match the performance of those thicker and heavier strings without the extra bulk! CORE is a 100% polyester string produced in small batches and composed of 4 varieties of thread weights specially chosen to create a one of a kind feel. The string has a medium tension with a nice soft feel that moves smoothly in fast play and has a perfect weight for whips and slacks. It has a thickness similar to our bulk poly so you won't get any bunching or snagging on tricks with multiple wraps. *CORE String is currently available in packs of 10 strings.